There almost wasn't a column this week. Many of the adults who arrive with kids in tow at Duarte's Pond off Lambert's Cove Road in West Tisbury to fish in the 39th annual Martha's Vineyard Rod and Gun Club Kids Trout Derby Saturday morning will have their own childhood memories of fishing the tournament. 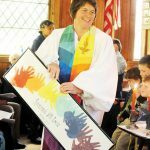 Jill Ardith Cowie was formally installed as the new minister of the Universalist Unitarian Society of Martha's Vineyard on Sunday afternoon. A "Jump for Japan" fundraiser by Tisbury School students raised $4,730 for the Japanese disaster relief fund. 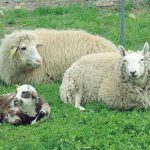 Sheepapalooza — the first annual celebration of sheep at The FARM Institute — was held last weekend. 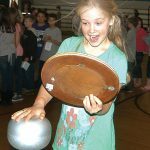 The Vineyard Energy Project (VEP) and Cape Light Compact (CLC) sponsored the second annual Energy Carnival at the Oak Bluffs School on April 28. The South Mountain Company announced it has completed the largest solar installation on Martha's Vineyard, a 92KW solar electric array and a 480-square foot solar water heating system at The Grey Barn and Farm off South Road in Chilmark. Aren't we enjoying a beautiful spring? Sunshine and warm breezes bring out many happy smiles. So much to report this week: where do I start? Well, first things first, our bell is back on the Old Whaling Church after being shipped away for repairs. Aquinnah voters will decide one contest at the polls Wednesday, May 11, a race for a seat on the three-member board of selectmen that finds incumbent Camille Rose, a veteran town official, defending her job against Beverly Wright, a former chairman of the Wampanoag Tribe. It was one year ago when a volcano in Iceland disrupted air travel throughout much of Europe and around the globe and turned the Minnesingers' long-awaited European performance tour into ashes. The Tisbury department of public works (DPW) recently drastically cut back brush and rosa rugosa along the bike and pedestrian path on Beach Road up to the Lagoon Pond launch ramp entrance. 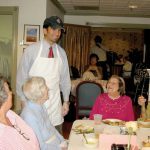 A spring family dinner blossomed inside Windemere Nursing and Rehabilitation Center on April 28, despite torrential rain and howling winds outside. Each spring we have the chance to start anew. We have the opportunity to take a fresh look at what we are doing in our relationship with our surroundings. It's a miracle that Paul Jackson of Edgartown is alive today. Last Friday Morrice Florist celebrated the royal wedding and invited everyone else who didn't get an official invitation to the grand event to join them. To The Editor:My family and I extend a big thank you to Chris and Chuck Wiley of Vineyard Gardens for the wonderful Easter Egg Hunt held on Easter Sunday.